The multi-hour experience of whale watching can generally be edited down to a few key frames: a burst of action on the clock face of the sea; the animal’s slow, elegant arc; and the Y of the tail, slipping below the surface. At that point, most whale watchers get distracted, turning back to their cameras to check if they pressed the button at the exact right moment. There’s actually more to see. Just as patient moviegoers are treated to “credit cookies” at the end of a film, those who keep watching the water are rewarded. Look where the whale was and you will see in its place, for a short time, a completely smooth, undisturbed crown of glassy water. How evocative! I began to look into the word. Google returns a single relevant result: source notes to Hoare’s book. It seems he heard it from a biology teacher in Massachusetts. The biology teacher, I found out, while speaking with her over the phone, heard the word from a whale disentanglement expert. The whale disentanglement expert told me by email that he learned it from an Iñupiaq whale hunter from Barrow, Alaska. The search eventually led me to another knowledgeable member of the Iñupiat: Qaiyaan Harcharek, a subsistence research coordinator at the North Slope Department of Wildlife Management in Barrow. He explains that the qala (pronounced similarly to “Carla”) is “almost a form of communication” between whale and man. It is even more informative to an Iñupiaq hunter than a paw print on the ground. The qala is more immediate; it reveals the precise location of a whale’s last surface movement. And it remains visible longer than the ephemeral spray from a blowhole, providing a signpost on an otherwise homogenous seascape. It is “our way of being able to follow the whale,” Harcharek says. Hunting a whale is chasing the qala. From the qala, a hunter can also infer the size of the whale; the larger the whale and the deeper the dive, the larger the surface print. This short scientific animation narrated by Rachel Levy of Harvey Mudd College in Claremont, California, explains how flukeprints are formed. Qala derives from the verb qalat—“the boiling or churning of water”—and can also be used to refer to the wake behind an oar or a propeller. But in the context of a hunt, qala is “a really special word,” says Harcharek. Whale hunters will not willingly enter the qala with their boats. The qala is the confirmed and respected domain of the whale. Hoare has romanticized the prints of the qala as “mirrors into the whale’s soul; and mirrors into ours.” Less of a mirror, the flukeprints are more of a signature in disappearing ink: the whale’s contribution to the canon of the oldest writing known on Earth. Glen Jeffries is a lawyer and writer based in Tromsø, in north Norway. Originally from the United Kingdom, he has studied and worked in Oxford, London, and New York. 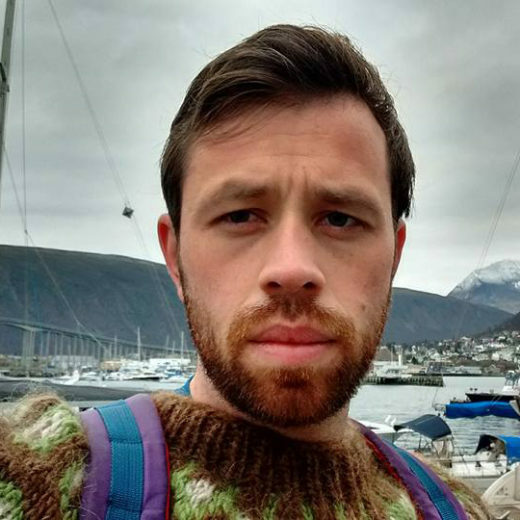 He moved to Norway in 2016 to focus on marine and environmental law in the polar regions (and to learn to traverse snow gracefully). He likes to write about whales, the wilds, and wrestling. Cite this Article: Glen Jeffries “The Path of the Unseen Whale,” Hakai Magazine, Apr 25, 2017, accessed April 25th, 2019, https://www.hakaimagazine.com/article-short/path-unseen-whale/.